1. Heat 1 tblsp of butter in a pan over moderate flame. 2. Add all the vegetables slices and cook till tender. 3. Add sugar, salt and pepper powder. 4. Apply butter and pizza sauce on the bread slices. 5. Place 2 slices of carrot, potato and cucumber over one slice. 6. Garnish with cheese and grill for 3 to 4 minutes till cheese melts. 7. Sprinkle some coriander leaves. Tip: You can use onions, capsicum, corn kernels or any other vegetable as desired. 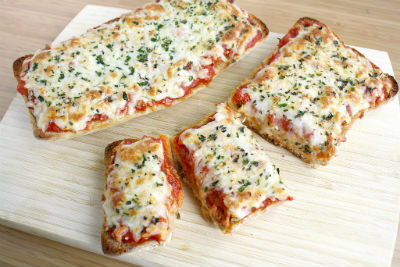 Feel free to comment or share your thoughts on this Bread Pizza Recipe from Awesome Cuisine.